You are wrong if you think that the joy of Wriphe comes principally from human relationships. If you had six comics and I took away four, how many would you have? If you had two dolphins and I gave you four more, how many would you have? If you had two amusement park rides and I gave you six more, how many would you have? Word on the street (or at least the word via the AJC) is that the Seiler family, owners of UGA's beloved Uga mascots, is looking to inject some fresh DNA into the winnowed Uga bloodline. Future Ugas should be smaller and look more like the bulldogs of yesteryear. Good for them. Our mascots have been getting far too heavy, and the breed has serious health issues that need to be addressed if it's going to survive into the 22nd century. There are some other Bulldogs that could use some new blood, too. Greyson Lambert has officially been named as starting quarterback in today's season opener versus North Carolina. Coach Smart has been hinting at this heavily for months now, so it comes as no surprise. It's a shame that Smart hasn't learned from history. Lambert, as all Bulldog faithful recall, was not spectacular last year. In fact, I blame Mark Richt's firing on his decision to waste a year on the arms of Lambert, Bauta, and Ramsey in anticipation of incoming wunderkind Jacob Eason. Richt learned the hard way that high expectations plus lackluster performance are a fast track to a pink slip. Eason, Smart says, isn't ready to start yet. He's playing it safe, putting in the proven commodity. Lambert is experienced. If he wins, no big deal. He's also terrible. If he loses, no big deal. That's the kind of selfish coaching decision you like to see: no matter what happens in the game, coach can't lose. Yet another indication of just how much we've lost by ash-canning Richt. Sink or swim, there's no time like the present to learn how to play the game. If Eason is as great as they've been saying, let's get him some game experience that counts at the start of the season when losses mean the least. When Bulldogs need new blood, procrastination isn't an option. If you had two video games and I gave you nine more, how many would you have? I was notified over Christmas dinner that Uga IX, aka Russ, died this week at the age of 11. What can you say to that? I settled for "Please pass the deviled eggs." Why was it that whenever Mark Richt had a bad year, an Uga died? In 2009, Uga VII died after losses to Oklahoma State, LSU, Tennessee, and Florida. After the 2010 season, which Georgia finished 6-7, Uga VIII died of cancer. Despite wining nine games (with a bowl game still to go), 2015 was so disappointing, we said goodbye to both Richt and Uga IX. Let's hope this tragic trend ends with Kirby Smart. May Uga X's reign be long and fruitful. I'll have more to say about old dogs on Monday. In the meantime, I'm going to Florida. If it's going to be 80 degrees in December, I might as well be at the beach. If you had seven dogs and I took away four, how many would you have? After the way the 2015 season has gone, I didn't think it was possible for the UGA coaches to outcoach anyone. 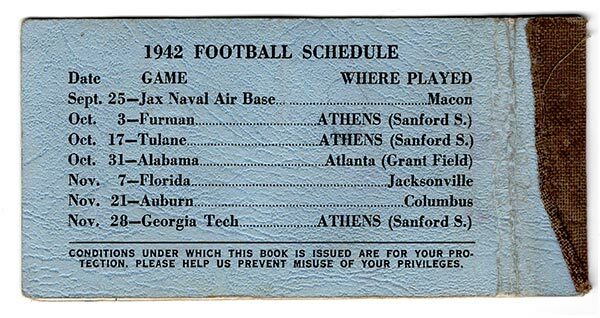 I didn't account for the Georgia Southern staff. 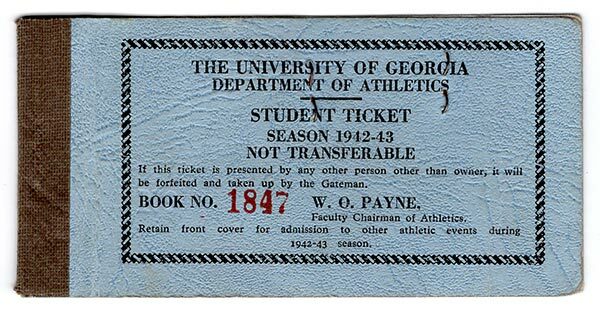 After trying and failing to find anyone to accompany ("I'll be out of town" and "I'd rather spend time with my girlfriend" were common excuses), the only reason I went to this game alone was to see the seniors introduced and see Que officially named Uga X. I got to the stadium 17 minutes before kickoff, and I was too late. I should have just turned around and gone back home. I suppose if you judge by the final score, it must have been a pretty good game. Some of the crowd seemed to enjoy it, especially the apparently 50,000 Georgia Southern fans in attendance. 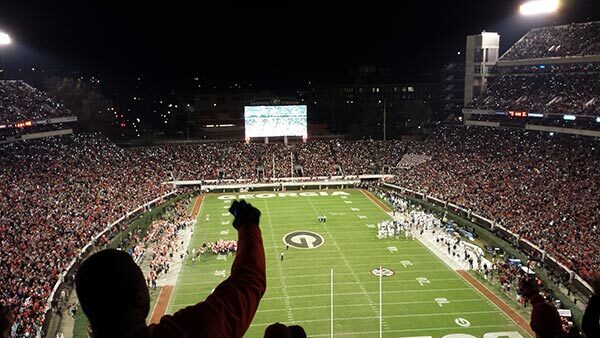 (The picture above was taken at the start of the 4th quarter when the fans turned on the lights on their cell phones in place of the usual "four finger" signal.) I did not. Greyson Lambert was his typically terrible self, and Georgia Southern only lost because... honestly, I'm not sure why. Tied 17-17, the GaSo coach kicked a late punt in an obvious attempt to reach overtime. I guess he'd heard that his team was a 13-point underdog, and maybe he had placed money on his team covering the spread. His kicker had easily scored a field goal from the UGA 31 to take a lead in the 4th quarter, but after reaching the UGA 16 in overtime, he went for it with a "wildcat" run up the middle that was doomed to fail. Why not kick to extend overtime? Typically, the answer is because underdog coaches feel they have to take a chance on the win rather than lose a protracted battle against a deeper team. However, that strategy only applies if you're playing catch-up (say, going for a two-point conversion as opposed to kicking). Maybe the GaSo players were out of gas. Maybe their kicker had broken his ankle. In overtime, if you can take a lead on your opponent, you should. Georgia Southern didn't and lost. 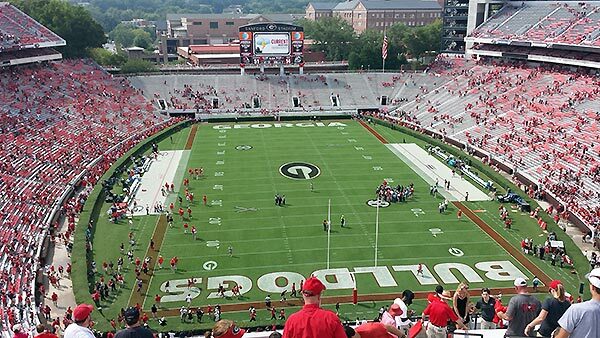 All UGA had to do was kick a field goal on their first overtime play, and they would have won. The fact that they ran up the middle for a touchdown doesn't excuse the Georgia Southern decision. Bad strategy is bad strategy. If only we could get the Georgia Southern coaches jobs at Florida. So now Georgia has 8 wins on the season, and I couldn't care less. "There's always next year" they say. Here's to 2016. If you had seven Alex Trebek autographs and I took away three, how many would you have? We left the season-opening University Louisiana Monroe/UGA football game with 9:54 remaining in the fourth quarter. But so did everyone else. The game was called after its second lightning delay with Georgia ahead, 14-51. The first lightning delay was called at 8:35 remaining in the third (ULM 14, UGA 35), and the game wouldn't restart for another hour. Friend Randy and I took shelter in the stadium concourse while it rained. It was hard to tell how long it might last. Even in the middle of the heaviest downpour, Randy's WeatherBug® app insisted that there was a 0% chance of rain in Athens, GA. The second delay was called completely unexpectedly during a period of sunny skies. The few of us left in the stadium watched as the two head coaches met on the 20-yard line. It was obvious to all of us what they must be talking about. Sure enough, they soon announced that the game was called. 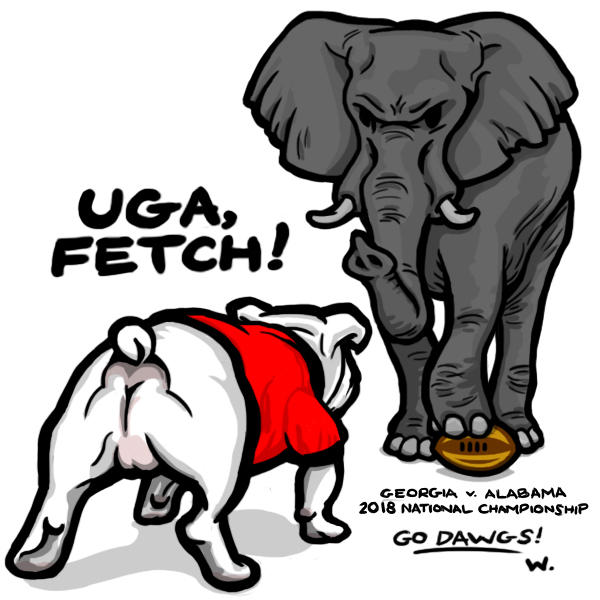 UGA win! It was fun Walt, lets do it again real soon. "Whats the worst that could happen??" Afterwards, if I gave you six more amusement park rides, how many would you end up with? Every year, I say I'm going to post more art here. This counts. 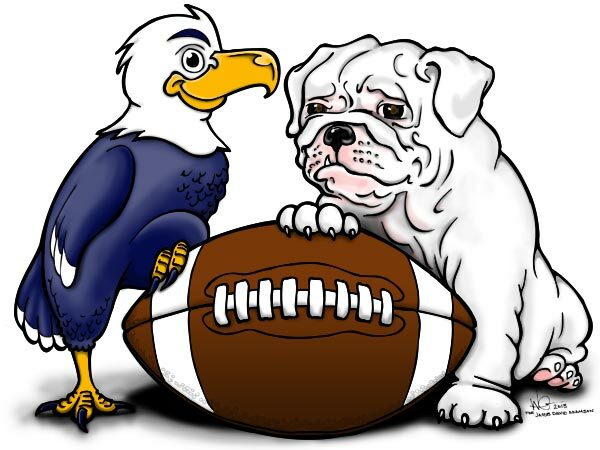 That's the Georgia Southern mascot Gus and the UGA mascot Uga drawn for a nursery wall. As I understand it, one wall of the nursery will be painted to look like a football field. Isn't it good to know that some babies are still raised with the right values? If you had six Jeeps and I took away four, how many would you have? The entire 2013 UGA football season represented in one play. It's a good thing Larry Munson is already dead. If you had seven blog posts and I gave you seven more, how many would you have? Mom and I traveled to Nashville to see UGA play Vanderbilt. 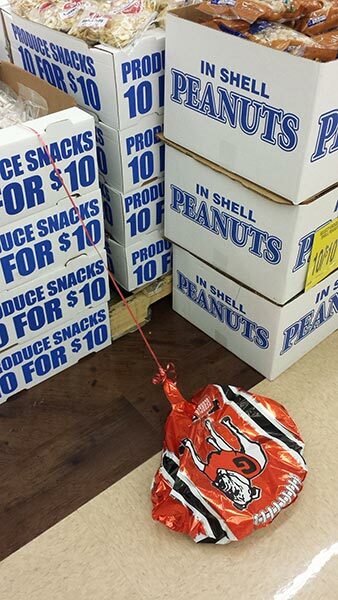 Instead of a football game, we saw an epic tragedy. It was cold and rainy at kickoff, and the sun didn't come out in Nashville until it had set on the Bulldog's SEC Championship chances. I could talk about the terrible targeting call that turned a failed Vandy fourth down conversion into a first down that finally broke the spirit of our staggering team. (Replay can overturn the ejection, but not the bad call itself? Who thought that was a good rule?) Or I could talk about the inability of our coaches to improve the failures that have defined them this season (Richt's special teams muffed a punt and a snap, Grantham's defense surrendered 31 points, Bobo's offense managed only a field goal in the second half, Tereshinki's conditioning resulted in a 6th player with a knee injury.) Or I could talk about Arron Murray failing to put it together with the pressure on again. But what it all comes down to is the fact that Georgia lost 31-27, and is now all but mathematically eliminated from SEC contention. What was such a promising season is now wasted. Heartbreaking. There is no other word. If you had ten novels written by James Walter Stephens and I took away seven, how many would you have?